Time for a small tip to customize your e-mail environment. Let’s say you have a default Mail client like MS Outlook or Lotus Notes at home/office. And you wish to hear a sound to let you know that you’ve received an e-mail, even when you are not looking at it. 1.Goto Start — Control Panel (Classic View) — Sounds and Audio devices. You will get a dialog box. 2. Goto ‘Sounds‘ Tab and scroll down in ‘Program Events‘ section and find ‘New Mail Notification‘ from it. 3. Select that option and click ‘Browse’ to choose a custom notification sound. 4. You can either choose from the stock audio files which will directly open under C:\Windows\Media or browse to anywhere in your hard drive and choose the audio file you wish to hear every time a new e-mail arrives. 5. Click Apply and OK. Done. You will now onwards hear that set sound whenever a new mail is delivered. Now, if you are working in Lotus Notes, you will have more options to play with, in mail notifications. 1. Open Lotus Notes and goto File — Preferences. Expand Mail and select ‘Sending and Receiving‘. 2. 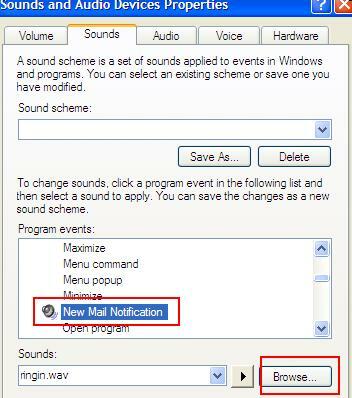 Check the options under ‘When new mail arrives:‘ and check the options you need to set, like getting a popup message for every new mail, or find a new mail notifier icon in the system tray, and of course, play a sound from the list of default windows sounds. Now, since I don’t have much experience with MS Outlook, I am not going to detail on how to set the same there. If you’re still in doubt after trying out the above steps, let me know! This entry was posted in PC & Tech Tips and tagged custom new mail notification sound, default new mail notification sound pop up, lotus notes new mail notification sound, mail notification sound in windows lotus notes ms outlook by vimalsuresh. Bookmark the permalink.